Jago & Litefoot became an instant success for Big Finish, deftly taking two immensely personable characters from the acclaimed ‘The Talons of Weng-Chiang’ and exploring a wealth of mysteries that challenged the competing scientific and supernatural explanations for events that formed such an intriguing dynamic for Victorian times. Able to effortlessly weave in travels through time and space courtesy of the Sixth Doctor alongside more contemporary threats both at home and abroad, the series has presented a wealth of storytelling opportunities anchored to the mesmerising performances of Christopher Benjamin and Trevor Baxter, and, as such, it makes perfect sense that Big Finish’s first crossover between the classic and modern eras of Doctor Who should also feature these beloved investigators of infernal incidents as they come across Strax the Sontaran of the likewise Victorian London-based Paternoster Gang. The manner of bringing these two elements of Victorian society together is befitting of each character as Jago and Litefoot’s exploration into the recent appearance of corpses with their brains removed takes them to the same location as Strax’s independent search for a dynachromic energy source. Perhaps unsurprisingly given the meeting of these larger than life figures, the plot itself is quite straightforward so that plenty of time can be spent reveling in the superb interactions between these characters. Of course, Strax is a rather divisive figure just because of how comedic and wholly atypical he is as a Sontaran, and his presence alone will be a point of contention for listeners who cannot get on board with that concept, but writer Justin Richards manages to incorporate him seamlessly while remaining true to the spirit of Jago & Litefoot even as the plot inevitably veers more heavily towards true science fiction than typical releases in the range. Dan Starkey is incredible as always in the role, and though he has appeared earlier in this range not as Strax, his Sontaran has an immense chemistry with Jago and Litefoot that carries every scene even as the very distinct backgrounds of the characters cause inevitable moments of humorous confusion as they try to find a less destructive middle ground than what Strax plans on several occasions. For those willing to accept Strax and all that he brings, there is a wealth of comedy that is mined from his inability to determine genders naturally and identities through a story device, his unfamiliarity with Victorian norms that comes to a head at Jago’s theatre show, and his rather blunt approach to problems, and though the resulting tone is inevitably subtly different from the more macabre- albeit udoubtedly with their own humour as well- stylings of the series, it works perfectly within the confines of an isolated celebratory release without ever being too outlandish. 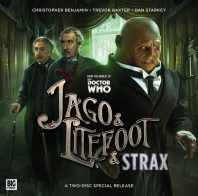 It would be tempting to have Strax steal all of the narrative thunder given the fact that he is the new character to the audio medium and carries the panache of the modern series, but Richards wisely balances out the three leads wonderfully and spends the first half of the story building a mysterious and ominous atmosphere befitting of Jago & Litefoot before bringing the Sontaran’s experience and know-how to the forefront. Carolyn Seymour gives an eerie performance as the mysterious Mrs Multravers who on multiple occasions is heard to ask a sequence of riddles to find suitable subjects for some ominous ploy, but her relation to Number 27 Bruton Street and the house’s haunted reputation dating back one hundred years in short order leads the investigators into the house, to the local library, to an enthusiastic local historian, and farther afield than they could have ever imagined. This is a plot that grows in magnitude and scope as it progresses in grand Doctor Who fashion, and even though Strax employs a rather volatile means of final resolution, the core of the ultimate visual revelation is very much down to the more human and sympathetic tones of his human compatriots. Despite its fairly light plot that extends and creates a few scenes for the purpose of exploring the humour of these disparate threads of Doctor Who meeting rather than fleshing out the narrative, the experiment of bringing the two eras of the franchise together must be called a rousing success overall. Celebratory special releases should be allowed to make the most of their characters even if some padding inevitably results, and Christopher Benjamin, Trevor Baxter, Dan Starkey, Conrad Asquith, and Lisa Bowerman all rise to the occasion spectacularly to open up an entire new world of crossover adventures Big Finish now has at its disposal. With the usual stellar direction and sound design supporting it, a deadly Victorian mystery injected with humour and science fiction seems perfectly at home alongside a seemingly ordinary theatrical impresario and pathologist.